My favorite snacks are ones that taste delicious while still being good for you. Often I find myself short on time and long on hunger, so I need to keep a supply of nutritious snacks at hand, both at home and in my car. Snacks for at home are simple, I can grab a handful of nuts or a piece of fruit as I stroll through the kitchen. Snacks for my car can be a real challenge. I cannot just leave a bunch of bananas on the backseat until I am hungry for them, and it can get messy trying to eat from a package of mixed nuts while driving down the highway. What's an active girl to do? I must eat, otherwise my mommy attitude gets replaced by one that more resembles a monster. 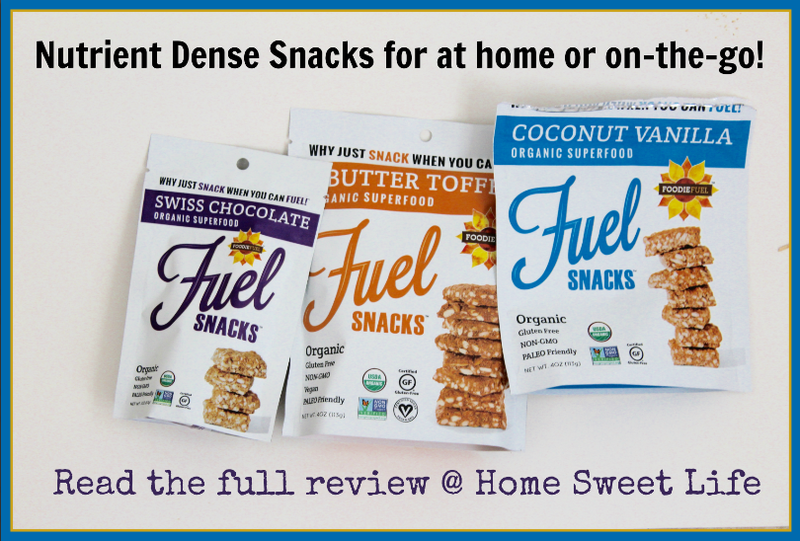 I found a great solution: Foodie Fuel snacks! Back in October I was introduced to the Foodie Fuel company and their oh-so-delicious snacks at the MomsMeet WOW Summit. Besides being a great organic, gluten-free, and paleo-friendly snacks to bridge that time in the afternoon when you're craving something a little sweet, these fuel snacks come in four flavors. Why is that important you're wondering? I'll tell you: as much as I like chocolate, I cannot be eating it every time I need a healthy car-snack. Too often I have found health-food companies focusing on everything chocolate, and not having enough alternative flavors. I was pleasantly surprised to find the Fuel Snacks from Foodie Fuel come in four unique flavors: Butter Toffee, Cinnamon Ginger, Coconut Vanilla, and Swiss Chocolate. Then - I tasted them - oh my! Deliciousness! I'll readily admit I went back by their booth a second, and then a third time to try the snacks all over again. Each flavor is distinctly unique, and the texture is somewhat crunchy, yet lightly chewy. It looks like a cracker, but tastes more like a cookie. Butter Toffee tastes the sweetest to me, but with only 8 grams of sugar per serving while still providing 2 grams of fiber and 4 grams of protein it is satisfying while not actually being that sweet. All of these flavors are made with low-glycemic, slow-burning carbs, healthy fats, and complete proteins. Cinnamon Ginger scored high with my husband on flavor, as he agreed that it was good, but knowing my tendency to not-share while hungry, his consumption of Fuel Snacks was limited. :) Arlene said this flavor reminded her of walking into a country store, with spices, candles, and pie. Swiss Chocolate is actually lower in sugar, with only 4 grams of sugar per serving, while still being quite tasty! One of the reasons these remain so good-for-you while tasting divine is the use of organic coconut sugar as the sweetener. The different flavors are all made with various combinations of nutrient dense food sources like: pumpkin seeds, sunflower seeds, chia seeds, coconut sugar, golden flax seeds, sea salt, and natural flavors. My absolute favorite flavor is the Coconut Vanilla Fuel Snack! Sadly, this bag was gone all too soon. I will need to order some more right away. Thankfully, the awesome folks at Foodie Fuel who provided me with this box of goodness filled with Fuel Snacks for this review also provided me with a discount code for all of you, our readers, to use to order your own Fuel Snacks. From today through December 31st, 2017, you can enter the promo code Homesweetlife at checkout to receive 25% off your order. That means you too can enjoy these delicious snacks, at home or on the go. By clicking on the pictures on the Shop page of their website, you can see the nutrition label and the ingredients list for each flavor. 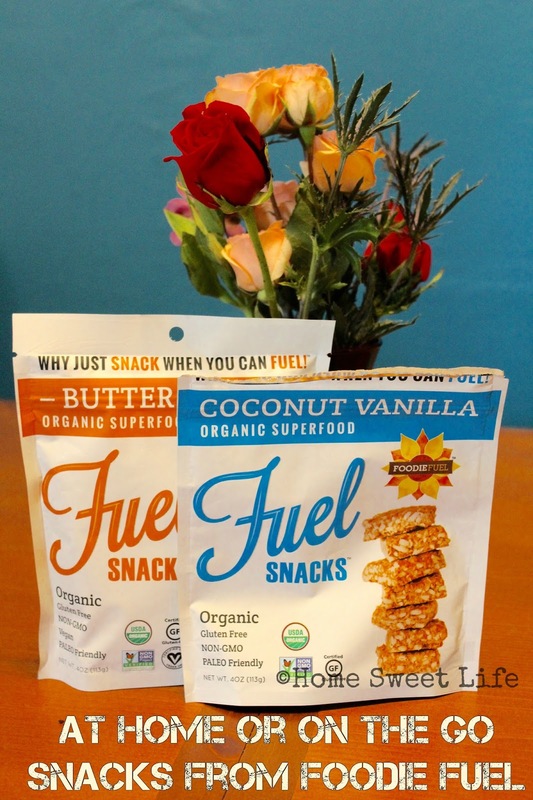 Fuel Snacks from Foodie Fuel come in two sizes: 2 oz (2 servings) or 4 oz (4 servings). The smaller bags are great for throwing in your purse, backpack, or gym bag, The larger ones are great for sharing, for using at home, for recipes like those found on their blog, and for gifting! Need any ideas for a foodie, athlete, or outdoorsman on your Christmas list? These would be superb! You can order in individual quantities of each flavor, or by the case. The 2 oz size comes in a case of 12 pouches, the 4 oz size in cases of 6 pouches. Foodie Fuel's Fuel Snacks can be found in over 1200 stores nationwide, and their website has a handy store locator feature. Now remember, you can get that 25% discount for your online order through 12/31/17 by entering Homesweetlife at checkout! 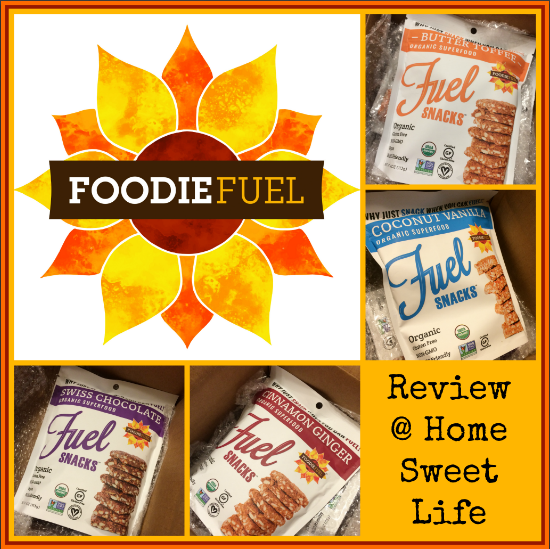 I received free Fuel Snacks from Foodie Fuel in exchange for this honest review. I was not required to write a positive review, nor was I compensated in any other way. All opinions are my own, or those of my family. I am disclosing this in accordance with FTC regulations.